Much has been written about the First Minnesota Infantry and its well-deserved place in Civil War history, but the experience of that famous unit was not typical. 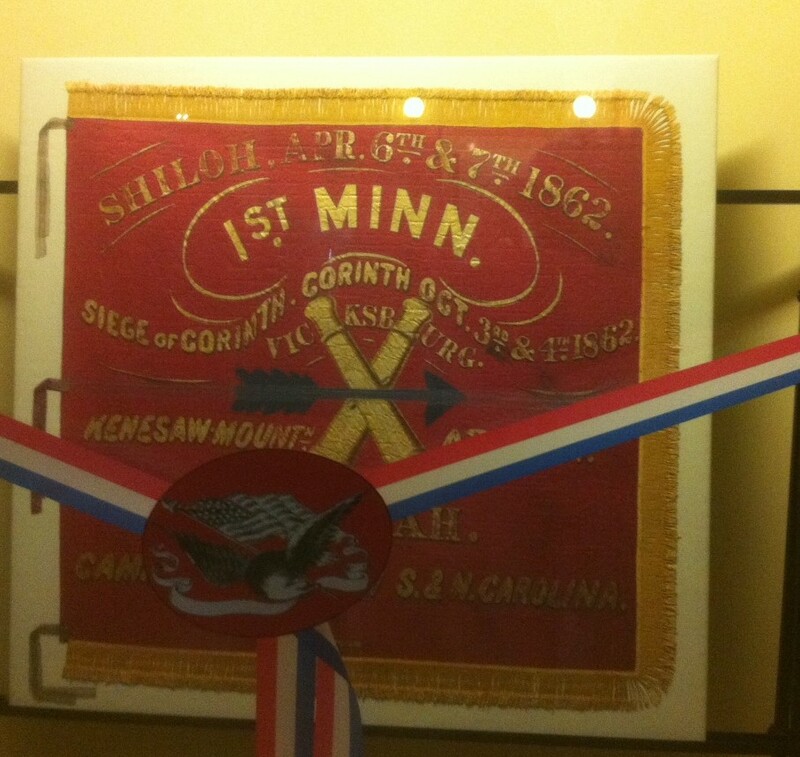 The great majority of Minnesota soldiers served in the Western theatre of the war taking part in battles from Mill Springs, Kentucky, to Sherman’s March through Georgia and the Carolinas. GENERAL: In accordance with your request of September 24, 1864, I herewith send to you a morning report of this battery from the 1st day of November 1864, also a report of the casualties, etc., during the year, and within a short history of the company. On the 1st of November, 1863, the battery laid in camp one mile south of Vicksburg; Captain Clayton, then commanding, received orders to go to Minnesota on recruiting service, and started on the 9th, the command then coming in my hands. The months of November and December were, whenever the weather allowed, improved in drilling the battery, also January and part of February, in which latter month, on the 11th, Captain Calayton returned with 73 recruits; on the 24th of February 5 veterans of the battery, in charge of Lieutenant Hurter, left for Minnesota. On the 5th of March captain Clayton exchanged the old guns, two 12-pound howitzers, and two 6-pound rifled guns, caliber 3.67, for four new rifled 3-inch Rodman’s guns. On the 25th the battery went out to black river, twelve miles from Vicksburg, with the First Division of the Seventeenth Army Corps, under Brig. Gen. E.S. Dennis. On the 4th of April we were transferred to the Third Division, under brigadier General Legett, and marched back to Vicksburg, were put on board the transport Z.C. Swan, left at dusk and proceeded up river and landed at Cairo, Ill. On the 17th disembarked and came into camp; there the veterans joined the battery again on the 21st. On the 27th embarked on transport Colossus, and moved up the Tennessee river, landed at Clifton, Tenn. On the 1st of May landed there, and after camping four days marched with the so-called Tennessee River Expedition, under Brigadier General Gresham, via Pulaski, Tenn., to Athens, Ala., camped there eight days and left on the 19th for Huntsville, Ala., arriving there on the 20th. On the 22d Captain Clayton left on leave of absence for Minnesota. At the reorganization of the Seventeenth Army Corps, commanded by Maj. Gen. F.P. Blair, the battery was attached to the Fourth Division, Brigadier General Crocker commanding. The corps left Huntsville for Decatur, Tenn., on the 25th of May, and from there marched via Summerville, Warrenton and Hendricksville, Tenn., and Cedar Bluff to Rome, Ga., 5th of June; from there to Kingston, Cartersville, Allatoona and Acworth, Ga., where we arrived on the 8th of June, joining there Sherman’s army, and especially the Army of the Tennessee, under the gallant McPherson, consisting then of three army corps; the Fifteenth, under Major General Logan, Sixteenth, under Major General Dodge, and the Seventeenth under Blair. 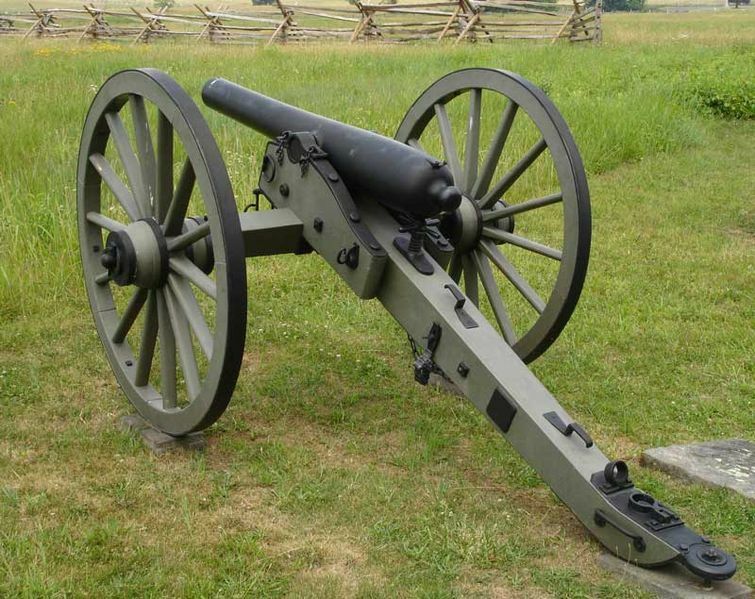 On the 12th of June our guns opened for the first time on the enemy, who had works north of the Kenesaw Mountains, on the top of which we could observe large crowds of people looking at the doings of the two armies. More or less firing until the 20th, when the rebels evacuated their lines, and the army advanced about two miles and took position on the foot of the Kenesaw Mountain. Heavy fighting was done there, but the enemy’s position being very strong, Sherman moved the Army of the Tennessee, then forming the left wing, on the night of the 2d of July, in rear of our lines of the other troops on the extreme right, thus forcing the enemy to give up his position on the mountain and in Marietta, in order to oppose our crossing the Chattahoochee river. On the 4th of July the right section with two regiments of infantry, Fifteenth and Sixteenth regiments of Iowa Volunteers, advanced towards Nickajack creek, but soon found the enemy in force; the whole corps was engaged before night, and on the morning of the 5th, after shelling the rebel works for about half an hour, the infantry stormed and took them, pushing the rebels slowly back in their main works on the river. The battery was in position on a high hill, in full view, about two miles from the rebel works, and although for some time fired on very lively, had nobody hurt. On the 11th the rebels evacuated during the night and fell back on the opposite shore. On the 16th the Army of the Tennessee made another flank movement to the extreme left again, passing through Marietta, Rosswell, crossing the Chattahoochee river near that place, and after passing Decatur turned westward, meeting the enemy about two miles from Atlanta on the 20th. The battery took position and opened with good effect, but so did the rebels, killing five of our horses, their shells falling thick around us, one shell striking under the trail of one of our guns and setting the piece straight on its muzzle. Fired some on the 21st. Changed position twice that day, and occupied that night and part of the 22d a fort in rear of the Third Division, Seventeenth Army Corps, near the place where Major General McPherson fell. The bloody battle of the 22d was fought under our eyes, we not being able to fire one round, as our trains were moving between us and our lines, until in the evening, when we silenced a rebel battery, who opened a flank fire on the Sixteenth Army Corps. On the 26th we made another flank move to the right again; arrived on the morning of the 28th near Ezra Church, when about noon the rebels made an assault on the Fifteenth Corps, but were badly repulsed, leaving the front literally covered with dead and wounded. The left section had taken position and fired a few rounds, but could not do much, the position being too much exposed. On the 30th July, when we had just moved into park, a 64-pound shell from the rebels struck the right caisson, exploded the powder in two limber chests and some of the shells, but did not harm a man with one exception, although we were at close intervals, and men promiscuously among the carriages. On the 2d of August the centre and left sections, and on the 6th the right section, moved into positions fixed for them in the lines; we were then about two miles from Atlanta, but fired our shells with ease into town. More or less firing was done, according to the enemy’s annoyance, we advancing our works ever few days. On the 14th Lieutenant Koethe was killed inside of our works by a stray rebel bullet passing through his heart, killing him instantly. On the 26th we moved from our position and with the army to the right, striking the Montgomery railroad on the 28th, destroying it effectually, and then moving towards the Macon railroad, meeting the enemy on the 31st near Jonesboro, and driving him steadily, following to near Lovejoy Station, when we returned to Eastpoint, going into camp there to rest, refit and recruit up. We laid there from the 10th of September to the 3rd of October, when marching order came suddenly; as our horses were not all in condition for a long, tedious march, only two sections turned out, the centre section remaining in charge of Second Lieut. John D. Ross at Atlanta, Ga. The other two sections were under command of First Lieut. H. hurter, Captain Clayton being chief of artillery, Fourth Division, Seventeenth Army Corps. We left camp at 6 o’clock on the 4th of October, marching over very bad roads till night, and next morning to a place three miles southwest from Marietta. From there we went through Acworth and Allatoona, where a few days before the rebels were nobly repulsed by a small garrison, of which the Fourth Minnesota Regiment of Infantry formed a part – Cartersville, Kingston, Adairsville, Calhoun, Resaca, through Snake Gap, to near Villanow, Ga., where we remained two days, and from where we sent all surplus baggage, etc., to Chattanooga, Tenn., leaving but one team with the battery. Marched on the 18th from here to Summerville, Alpine, Ga., to Gaylesville, Ala., where we camped from the 21st to the 29th. 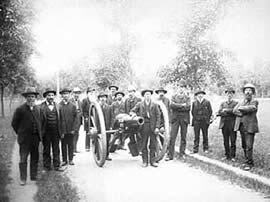 During this time the artillery of the Seventeenth Army Corps was organized into an independent brigade under Major Powell, Second Regiment Illinois Light Artillery, Captain Clayton being assistant chief of artillery. Out of ten batteries belonging to the corps, only three were selected to remain with the army, via. : the Fifteenth Ohio Battery, First Lieutenant Burdick commanding; Company C, First Michigan Light Artillery, First Lieutenant Shier commanding, and First Minnesota, Lieutenant Hurter commanding. All the others were sent back to Nashville, Tenn., into the reserve artillery pack. Left camp on the 29th at 6 o’clock A.M., marched through Cedar Bluff, and arrived on the 30th near Cave Spring, Ga., where we remained in camp on the 31st in order to have the troops mustered for pay. This, general, is a short sketch of the military history of this battery. Any particulars you wish to add, you will be enabled to get from our non-veterans, who will soon be discharged and return to the state. On the 2d day of July the battery moved from its former position at the foot of Kenesaw Mountain to the right. On the 4th it was ordered, section at a time, to the front and went forward with the skirmishers. During the day it fired about 80 rounds of ammunition; during the night constructed a work and on the morning of the 6th went into it. On the 8th the enemy opened from a post in front of us, with 18 pieces of artillery. We, with other batteries of our division, returned the fire. We fired 123 rounds with good effect. On the 16th moved to the left and crossed the Chattahoochee river at Roswell; went into position on the 20th and fired 130 rounds. While in this position we had 1 private and 4 public horses killed with one shell from the enemy’s gun. On the 26th moved to the right. On the 27th the battery was engaged while the enemy was stubbornly endeavoring to turn the extreme right flank of our army, and fired 22 rounds from one section. On the 30th the battery was relieved and moved into park at 5 o’clock P.M. At 6 P.M. we had 1 caisson blown up by the explosion of a 64-pound shell thrown from the enemy’s gun. The 3-inch Ordnance Rifle, like the one seen here, was a staple of the Battery from March 5, 1864 through the end of the war. SIR: I have to report the death of First Lieut. William C.F. Koethe of the First Minnesota Battery, who was killed on the 15th of August, while temporarily in command of four pieces of this battery, which were in position to operate against the city of Atlanta. The enemy had a complete enfilading fire upon the position which Lieutenant Koethe occupied, and a rebel sharpshooter shot a ball through his left arm, which passed through his heart and came out on his right side. He died without a struggle. Lieutenant Koethe was from Germany, where his father still resides. He entered the battery, at its original organization, as a private; served as such until the 1st of September, 1863, when he was promoted to second lieutenant for his noble worth in the service of his adopted country. He was again promoted to junior first lieutenant, July 19, 1864. He rendered noble service on the 20th, 21, 22d and 28th of July, in command of his section of the battery, during the fearful struggle in front of Atlanta. EXTRACT FROM MONTHLY REPORT OF FIRST MINNESOTA BATTERY, DATED AUG. 31, 1864. On the 1st of August the battery laid in park near Ezra Church, Ga., in rear of our lines. Centre and left section moved into position on the 2d and the right on the 6th; they fired more or less every day until the 25th, when the whole army of the Tennessee moved to the right, striking the Montgomery & Atlanta railroad on the 28th. After destroying the same effectually we moved on towards Jonesboro, on the Macon road; we came into position on the 31st, but did not fire any that day. NEAR ATLANTA, GA., Sept. 15, 1864. GENERAL: Inclosed please find the return of this company for the month of August, 1864, it having been utterly impossible to forward the same at an earlier period. The battery is now in camp, resting from the fatigues and troubles of the late campaign, but preparing vigorously for a fall and (who knows), if necessary, winter campaign. May only the North make one more effort, send forth the scores of young men lounging around in the great cities, wasting their money and their health, and fill up our decimated ranks once more, I am sure that the next summer would not see anything more of this rebellion. But, alas! How many homes will be desolate, how many hearts of loving wives, endearing children will wait in vain for their returning husbands and fathers! Many a place will be vacant, that before the war was blooming in health, beauty and love, its occupant lying silent and cold in strange soil! We too have to lament the death of two of our men, two of our best soldiers, who have died, not on the battle-field, but victims to disease and the treatment that our soldiers receive from those so-called surgeons in the hospitals. William Vincens, sergeant, and Gustavus Andre, private, both from New Ulm, died, the latter on the 4th inst., at Vining’s Station, Ga., the former at Atlanta on the 7th inst. Their friends will be much surprised at the news, as the time of the enlistment of the two was almost expired. EXTRACT FROM THE MONTHLY REPORT OF FIRST LIEUTENANT H. HURTER, FIRST MINNESOTA BATTERY, DATED NEAR ATLANTA, GA., SEPT. 30, 1864. The battery marched on the 2d instant from the position it held on the 1st near Jonesboro, Ga., to the right, and when near Lovejoy’s Station, came in sight of the rebels, firing about thirty shots at them. On the 5th instant it left this position again, marching back to Jonesboro and Eastpoint and reaching the present camp grounds on the evening of the 9th, whence we tried to fix ourselves as comfortably as possible. On the 4th instant Private William Winges was wounded in camp by a rebel rifle ball passing through his left cheek. EXTRACT FROM REPORT OF COL. WILLIAM HALL, ELEVENTH IOWA INFANTRY, COMMANDING THIRD BRIGADE, OF OPERATIONS JUNE 27 AND JULY 5 AND 22, DATED HEADQUARTERS THIRD BRIGADE, FOURTH DIVISION, SEVENTEENTH ARMY CORPS, IN THE FIELD, GEORGIA, JUNE 28, 1864. EXTRACT FROM REPORT OF BRIG. GEN. WILLIAM W. BELKNAP, COMMANDING THIRD BRIGADE, DATED HEADQUARTERS THIRD BRIGADE, FOURTH DIVISION, SEVENTEENTH ARMY CORPS, NEAR ATLANTA, GA., SEPT. 11, 1864.